The closure of public toilets in Weston, Larkhall, Combe Down, Twerton and Peasedown St John are to be brought forward to this August, according to an announcement from Bath and North East Somerset Council. The news has sparked anger from Conservative councillors, who have accused the Liberal Democrat-run authority of going back on a promise to keep the toilets open until next year whilst alternative provision is sought. 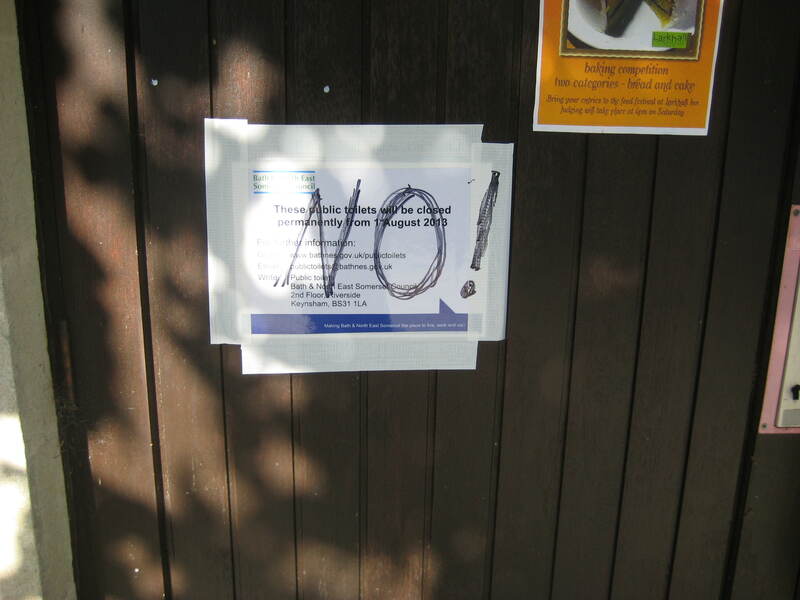 Not everyone is too happy about this closure notice outside the Larkhall loos! The Council has notified local councillors that notices will be put up on the toilets B&NES plans to close thirteen of its public toilets in total. However, the closures were not expected to begin until 2014, which is when the savings anticipated from the closures were programmed to materialise in the Council budget. Whatever the justification behind the closures, l find the whole business rather ironic – coming as it does from an Authority destined to see a rise in the number of people who might be said to benefit most from such public provision. The Office for National Statistics forecasts a 37 per cent rise in the number of over-65s from 31,600 to 43,200 by the end of the next decade. While a 67 per cent hike in the number of over-85s – from 4,900 to 8,200 – is expected during the same period. Try telling that to an elderly person searching for a loo! Our Victorian forefathers were so proud of their municipal services including such ‘mod cons’ as public toilets. We squander our heritage for short-term convenience. One of Larkhall’s local cafes. P>S> I suppose Larkhall’s cafes will benefit from the closure of the local loos. Tea and pee l think they call it?! P>P>S> Ironic that the district has just got a library. That which the Lord giveth…. etc, etc.